Jim Miller, meaningful resources, technology, Web site design, Willowgreen Inc. The meaning of life is to see. Ten years ago, I designed and produced a Web site for one of my clients, Jim Miller at Willowgreen, Inc.; a publishing company that produces “meaningful resources for hope, healing and inspiration.” Since then, I have not only maintained his site, but I have also designed and produced print and electronic media for his company. Having Jim as a client has been a graphic designer’s dream. He is a writer and an excellent photographer. His portfolio of breathtaking photographs assures me that I can hardly produce an ugly design. Also, I have been able to contribute hand-rendered illustrations to some of his publications, and spread my wings into electronic publishing. Last spring, we embarked upon a complete redesign of the Willowgreen Web site. I produced a site plan and visual design which we turned over to a programming team who setup the store in Shopify. The redesigned site was recently launched. What do I like best about the new site? In addition to Jim’s photography and insightful writing, I like that there is a balance between the commercial aspects (selling products in the new store) and free offerings. 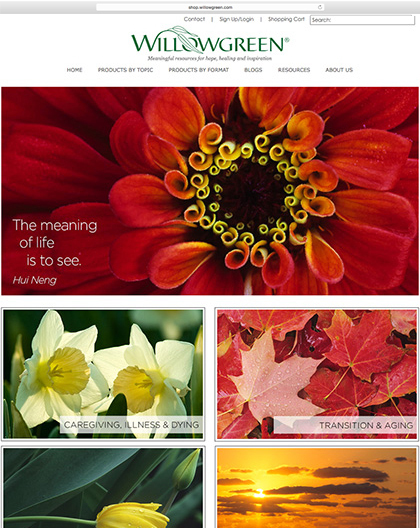 The homepage alone with its inspiring slide show and video is a place to go just to meditate. There are free eCards, inspiring blogs, and helpful writings for caregivers and those who are grieving. One of the many things that I am thankful for this holiday is that I have had the honor of serving the kind and gentle folks at Willowgreen.